NEW ORLEANS â" Jazz horns, Cajun fiddles, zydeco washboards and rock guitars â" they'll all be heard at the same place for the next two weekends when the New Orleans Jazz and Heritage Festival kicks off Friday. 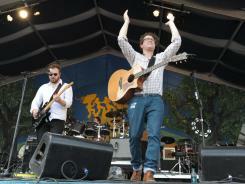 The festival known simply as Jazz Fest spans two weekends, Friday through Sunday and May 3-6. This year's lineup includes mostly Louisiana acts accented with national headliners such as Bon Iver, the Beach Boys, the Eagles, Tom Petty and the Heartbreakers, Cee Lo Green, Ne-Yo, Bruce Springsteen and Jimmy Buffett. Though Jazz Fest has boomed in diversity and popularity in its 40-plus year history, Cajun fiddler and singer Michael Doucet says it's still the best festival for homegrown Louisiana music like his. "The festival has evolved, but it's a great thing that The Boss is playing here," said Doucet, front man for BeauSoliel, which performs Friday. "It's an opportunity to catch music that's familiar, music that you're used to hearing at Jazz Fest, but then have the opportunity to hear something new and different." Doucet, who has performed at almost every Jazz Fest since the mid-1970s, said it was one of the first major festivals to showcase Cajun and zydeco music. Before the 1970s, music fans often had to travel to small Cajun towns like Eunice, La., or to the city of Lafayette to hear such music, he said. "Jazz Fest got behind us and our music early on," said Doucet, who will be performing on the festival's "fais do-do" stage, a Cajun French term for a dance party. "This festival has helped raise awareness about our music. It's really done so much for us." Troy "Trombone Shorty" Andrews, the subject of this year's official Jazz Fest poster, said the festival showcases New Orleans' music scene beyond the stage with Mardi Gras Indian performances and second-line parades. "It's a great situation for people to enjoy the New Orleans culture," Andrews said. "Sometimes when a tourist comes to town, they may not have a Sunday afternoon where they can go check out Rebirth at a parade but they can still check out some brass bands here. We try to bring everything into the festival, and it's just a great opportunity for everyone." Proceeds from the festival benefit the nonprofit New Orleans Jazz and Heritage Foundation, which works to fulfill the festival's grass-roots mission to stimulate the music culture in Louisiana and reinvest in the community with music education programs, said Don Marshall, the foundation's director. In its humble beginnings, the festival featured only a handful of acts and drew only about 350 people to Congo Square, Now, more than 40 years later, a festival horde packs the Fair Grounds Race Course. There are 12 music stages and countless other presentation areas for cultural demonstrations, including exhibitions by Native Americans and cooking demonstrations by some of the area's renowned chefs. In recent years, the festival has drawn nearly 400,000 visitors over the course of the two weekends. The festival's growth has allowed the foundation to provide $500,000 in grants each year to other nonprofit organizations supporting the arts, as well as to writers, artists, photographers, filmmakers and education programs. "I haven't seen another model like this anywhere," Marshall said. "This festival has grown to the point where we're able to generate revenue that allows us to establish free music education programs, housing initiatives and lecture series. One of the best things we do is the grant program." Before Hurricane Katrina in 2005, Marshall said, the foundation offered roughly $100,000 in grant money every other year. But with the need for music and cultural redevelopment so strong after the storm, the foundation restructured its grant program to make more money available. "We're really committed to keeping the culture alive, and we believe helping musicians and all artists is pivotal in making that happen," Marshall said. The foundation also recently held a competition in which schools were asked to form their own brass bands and compete for $30,000 to purchase instruments. The idea was to get brass bands in schools, not just marching bands, Marshall said. The foundation is also set to begin in November renovating a 12,500-square-foot funeral home purchased four years ago and turn it into a music school. The building, located in the city's historic Treme neighborhood, is in the same block as the foundation's headquarters. "It's an incredible building with a winding staircase, central hallway and double parlors," Marshall said. The building's unique history as a funeral home from which jazz funeral processions set out makes it an extra special location for a music school, he said. "We are working with architects to keep the historic nature of the building intact," he said.